Welcome to Part 2 of this Under the Hood series. Today I want to go over the flight mechanics and AI, and the best ways to approach them in order to come out on top. Especially against that devilish Baron! Another important aspect of your dogfighting capability is your plane’s upgrade level, so I’ll get into how that works too. I say ‘desired’ because you don’t directly affect the plane’s direction or thrust, you are making demands of it. The plane’s ability to meet your demands is determined by its upgrade levels of turn rate and acceleration, and its damage levels. Engine damage affects maximum thrust, while wing and tail damage affect turn rate. And thrust affects lift, so at lower thrusts the plane becomes more ‘drowsy’ and less responsive to changes in direction. You can see the damage levels of your plane via the damage HUD (left on the d-pad unless remapped). This has an important side effect: it makes them predictable. Ideally you should be close enough to your target to see which direction they are turning and angle yourself to best get behind them for a kill shot. However, often they are off screen and, depending on the mode, you will see just a marker. But you know that they will be simply trying to fly at you, guns blazing. If they just flew past you they will need to turn around to do this, so chances are they are flying in a circle either clockwise or anti-clockwise. The radius of this circle is determined by their difficulty and wing/tail damage. You can use this to your advantage to come in behind them. By all means put a few bullets or rockets down range in their direction on approach, but before you get too close, aim to pass to the side and then turn in behind them. There are a couple more advantages you have as well: your plane can go higher than theirs, and you can dare to go much lower than they do. Be careful going higher though as you will lose some degree of control in the thinner air with reduced thrust, so getting close to the ground and coming up under them as they fly over is a much better idea. It should be clear by this point that one of the most important aspects in dogfights is turn radius. With that in mind, it’s often worth putting a few bullets into the enemy to reduce theirs, meanwhile making sure to collect as many upgrade crates as you can to maximise yours. There are several attributes to your plane that can be upgraded (different game modes may have reduced amounts). Each attribute has a fixed number of upgrade crates it requires to maximise the stat, and you will only ever be given exactly this amount over the course of whichever mode you are playing. Upgrade crates are fed to you with varying rules depending on the mode. However you should always strive to get as many as you can, because the enemy is constantly upgrading too and it’s important to stay ahead of the curve. It’s also very important in campaign modes to get your guns to a sufficient strength that allows you to cut through ground forces like butter. Ground forces don’t get any harder to kill, they simply get more numerous. And their difficulty is based on distance from the carrier, unlike the enemy planes. Normal/Veteran Campaign: as soon as you start you should be able to get a couple of upgrade crates. But then your upgrade level will be capped until you complete missions. After every mission complete, kill an enemy plane to see if it will give you a crate. Keep killing planes until they stop giving crates. They won’t give any more until you complete more missions (you may have to complete 2 or more). One notable exception is the Baron. He will always drop a repair crate when you disable his plane (which can’t be destroyed) then another two upgrade crates when he explodes into the ground. Frontline Campaign: the upgrade level in this mode jumps up every time you advance to a new island. Your first action should be to keep killing enemy planes until they stop dropping upgrades. Finding the enemy airfield and killing them as they take off is a very viable strategy. If you should fail the island you still keep any upgrades you collected on that run. Survival: every plane killed drops an upgrade in this mode. Bomber Defence: the upgrade mechanism in this mode is different – instead of upgrade crates, each kill fills up the bar in the top right. When this bar fills up fully, your bomber’s guns and armour are upgraded and the bar resets. Hot Potato: there are no upgrades in this mode. Rogue Ace: this mode starts you and the enemy at maximum upgrade level, so any upgrade crates you see in this mode will re-arm rockets, bombs, refuel your plane or repair it. At Infinite State Games, we are of the older ilk of gamer. From a time when a tight arcade game loop was enough to keep you coming back, and the struggle to beat your own score and the promise of unlocking more things was the motivation to keep you going. And Rogue Aces very much follows this old school model. Normal Campaign – the default game mode unlocked from the start. Enemy planes and mission targets are marked, and auto landing is allowed. Frontline Campaign – every island in this mode requires you to capture a base, so you unlock this mode when you capture your first enemy base (see More->Tutorials->Capturing Bases for more info). Only the nearest Allied Base is marked, but auto landing is allowed. Veteran Campaign – this mode is for the best of the best, so it is unlocked when you prove you can reach mission 20 in the campaign and defeat your first Baron. In this mode there are more enemy forces (land, sea and air) and they are stronger. Mission targets are marked as usual, but enemy planes are not. 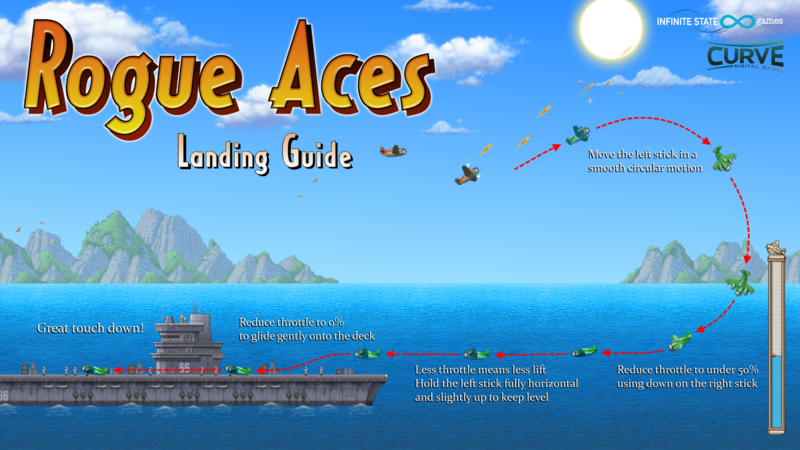 There is also no auto landing, so check out that Landing Guide! Survival – this is a mode for the dog fighting purists out there, and so is simply unlocked by, well, dog fighting. Kill 20 planes in campaign mode to unlock this mode. Planes are marked, but there is no auto landing. But then landing resets your multiplier, so you’ll probably want to find another way to stay in the fight. Bomber Defence – this one is a little bit different and a little bit hidden. To unlock this mode you need to view the Credits. Eventually you can control a bomber. Once you’ve scored 5 kills the mode will unlock. Hot Potato – this mode is what happens when your game spends too long in development! You have no weapons and must hop from plane to plane via Aerial Steals. And so you unlock it by getting 3 or more Aerial Steals in any game mode that allows it. Training Ground – this mode is unlocked by default. It is an excellent place to come and practise your flying skills as there is no map collision. And for extra fun you have infinite rockets and bombs. That never gets old! Good luck unlocking them all, pilot!